My husband Ollie and our son Henry both have a love for things that are remote controlled. Be it cars, boats, helicopters or drones they are not fussed! That’s why I got some excited squeals and squawks when I announced that we would be having fun with one of the Monster Smash Ups radio controlled trucks! The Monster Smash Ups truck is charged via a USB. Once fully charged there is a run time of around 30 minutes which is fair. Charging takes slightly longer at around 90 minutes but once you remember to put it on charge the process is very simple and easy. The truck itself is realistic in the way that it tilts and move. It was one of the easiest remote controlled vehicles we have had and Henry picked it up quite easily from the start. Unlike with some remote-controlled toys crashing is all part of the fun with Monster Smash Ups. When the front bumper is hit, it activates the ejector seat and the driver goes flying! 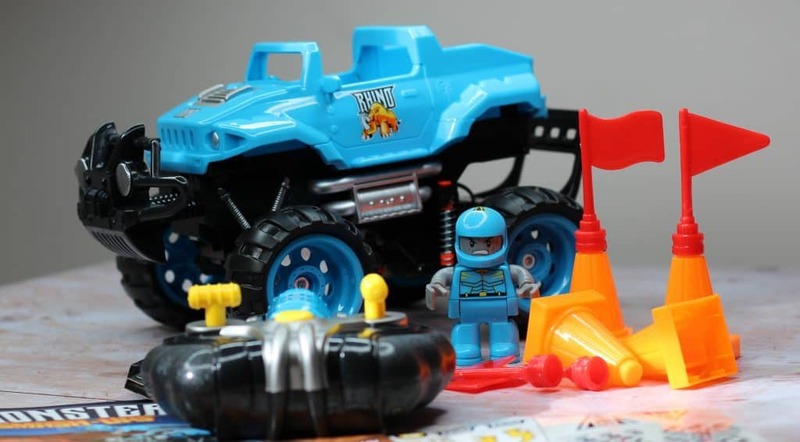 The Monster Smash Ups trucks can be used independently or for racing with friends and if parts come off they are easily rebuilt! 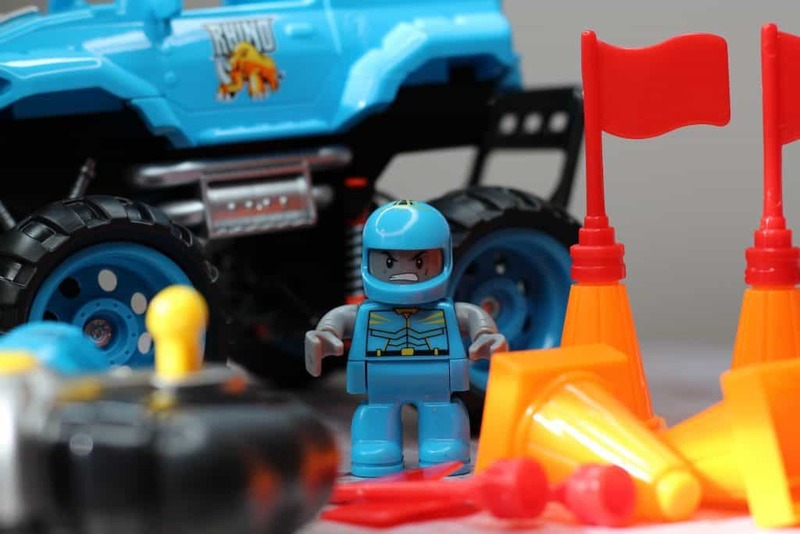 The truck comes with stickers so little ones can customise them and cones so they can race or create obstacles. The truck only needs two AA batteries (not provided) for the remote and you are good to go! As the Truck recharges via the USB it means that you don’t need an endless supply of batteries like you do with some remote controlled toys. Henry loved the Monster Smash Ups truck and found it easy and simple to control and direct. 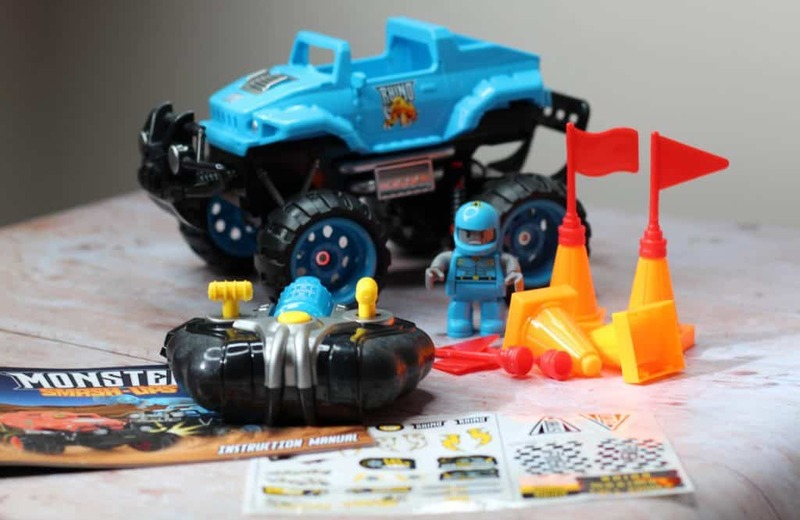 Even when he crashed the truck and pieces came off he found it fun and easy to reassemble the truck again. The fact that the driver ejects created lots of giggles and endless fun. As far as remote controlled toys go this has to be one of my favourites because it’s so child friendly and robust. The toy can literally be smashed into things and it doesn’t break it simply needs re building. This is also a toy that Henry didn’t need too much assistance with which gave him that independent feeling and also meant that he didn’t need me to be able to play with it. 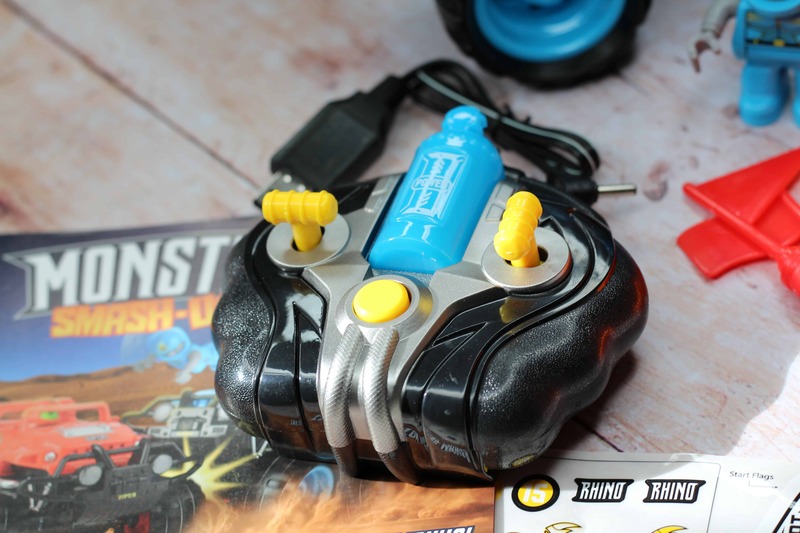 I received the Monster Smash Ups truck on a gifting basis in return for an honest review however all words, opinions and views on these products are my own. Every effort has been made to provide correct pricing at the time of printing please see individual websites for exact up to date prices. Links marked with * are affiliate links. For more information on any of this please visit this page.